Wong’s Products LLC. started to EM® on his taro fields in Nov. 2013 due to disease outbreak. He then took over the commercial prawn production after brother retired in 2013. Gerald wanted and find out new technologies that’s available and asked us to help. With the collaboration from APNAN technical staff and EMRO Asia staff who has had years of experience in aquaculture especially in shrimp farming, we were able to come up with guidance on how to treat and prepare his large ponds to have high plankton and raise healthy clean prawns using EM® as a probiotic on its feed. He has since expanded its use and introduction EM® earlier to his new stock of post larval prawns (baby prawns). May 2014, before EM® use, the prawns were covered with algae growth around its tail and pinchers. Though tasty, it did not look very clean. After incorporating EM® sprayed onto its feed as a probiotic, he has seen improvement in two weeks. The prawns are no longer covered in algae, while the quality is much higher and taste is much cleaner. In 3-4 months the quality of the water also improved. 2014 they were only able to stock their ponds with 300,000 baby prawns due to low availability. However with continued use of EM® as a probiotic his feed, production continued to rise in 2016 and 2017. 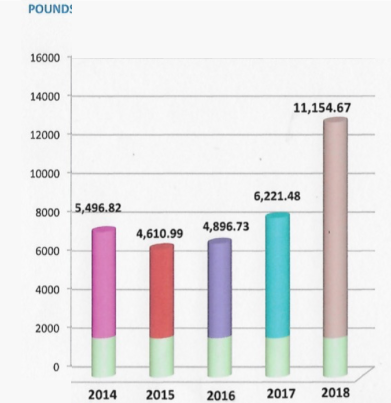 What impressed him most of continued use of EM® the difference in production from 2017 and 2018 since he was only able to stock his pond with 170,000 baby prawns (close to half the amount). The increase in production in 2018 close to double 2017 year harvest. He believes the reason is for decline in the mortality rate of his baby prawns, which means he is able to increase the survival rate and harvest more adults size prawns. Restaurants and resellers not very happy with appliance. Photo of Prawns after 3 years of continued EM® Probiotic use, harvested April 2017. Very clean, healthy and tasty!